Well...I got some bad news at work yesterday that's got me freakin' out quite a bit. I can't share until I know a little more about what's going on. 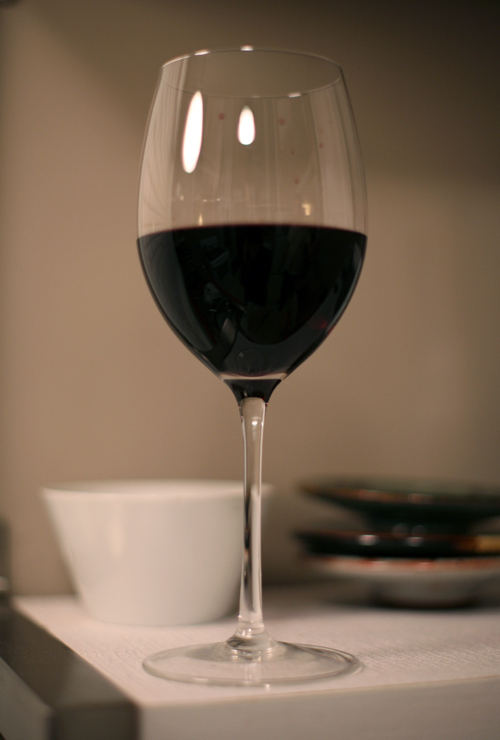 Needless to say, I spent the evening talking things through with my hubb, a bottle of malbec and two pints of Ben + Jerry. (Don't worry, we didn't finish them both, we just passed the two flavors back and forth a few times. I wasn't THAT depressed...). Breakfast: cereal! Shocking, I know. I had 1/2 cup of TJ's Pomegranate Blueberry Flakes mixed with 3/4 cup of Nature's Path Pumpkin Flax (finally, the last of it!!! 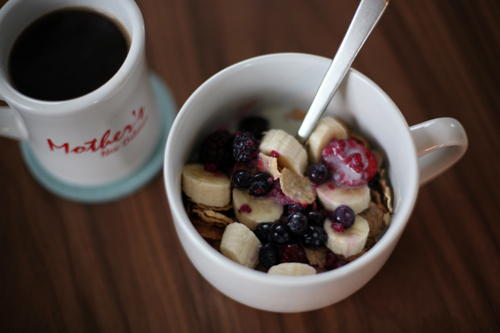 ), topped with 1/2 a sliced banana, 1/4 cup frozen mixed berries and 1 cup plain soy milk. This did not stick with me AT ALL. I was hungry by 9:30am, at which point I caved to the homemade donut guy who sets up his cart right outside my office on Fridays. Totally unfair. Mid-Morning Snack: homemade apple cinnamon donut - DIVINE! Lunch: out with a friend! We went to my favorite lunch spot, Bizou, where I had the Salmon Cakes with baby greens and a side of hand-cut fries. Not the healthiest choice...it was definitely one of those days. 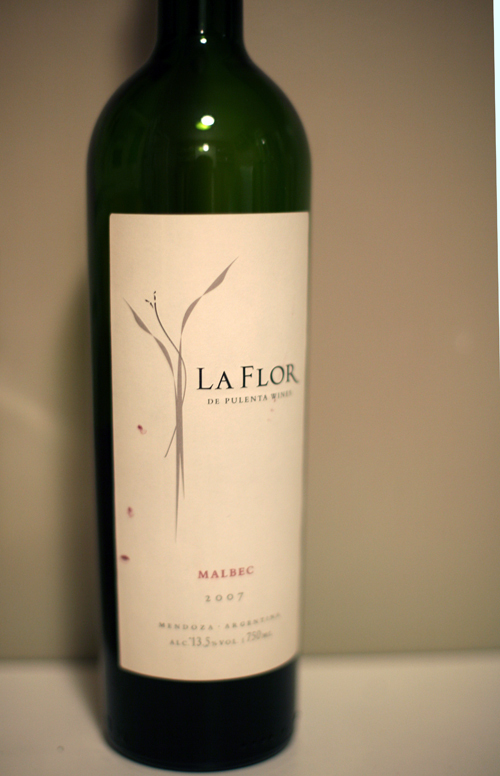 But there was wine, a really tasty Malbec. 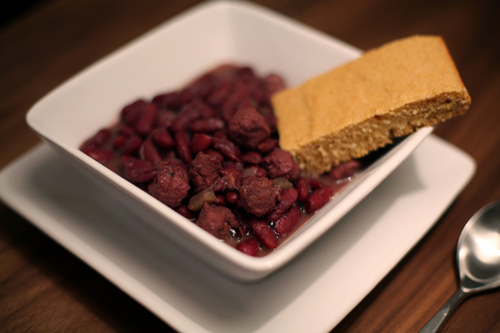 This recipe is really easy, its basically the same recipe I use for most of my bean soups. The spices just get switched up a bit. Sorry...no time to plug in nutritional stats in MFD. I'll update this afternoon. Combine all ingredients in a large soup pot. Seriously, thats it. I bring it all to a boil, then reduce to a strong simmer and cover. 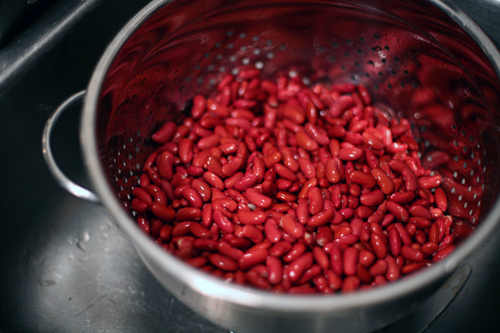 It should cook for 1-2 hours, until the beans are soft but not falling apart. 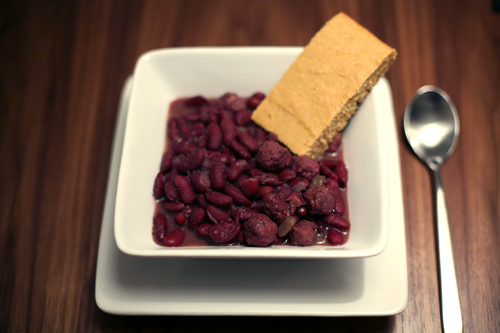 Once soft, ladle out about 2 cups of beans and broth. I try to avoid getting any sausage. Place the two cups in a blender and puree, then add back to pot. This will thicken the soup. Alright, I'm off for some stretchy meditation. Have a great Saturday!